The Shawnee Indian Mission was established in 1839 in Johnson County and operated as a school until 1854. It then passed into private ownership and served different functions until it was acquired by the state of Kansas in 1927. In 1983, rehabilitation of the two-story East Building was begun. During the removal of a ceiling, a nest of an eastern woodrat or pack rat was discovered. 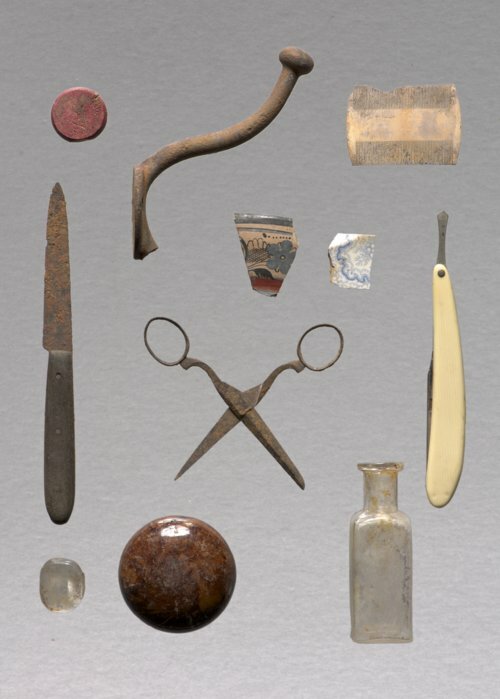 A total of 80 items had been packed into the nest, including those pictured here: a clear square glass bottle; a blue transferware tableware sherd; a hand-painted buff-bodied earthenware bowl rim; a complete paring knife; a clear glass oval filial from a bottle stopper; a red wood and cork bottle stopper; a bone fine-toothed lice comb; sewing scissors; a coat or hat hook; a complete Rockingham door knob; and a complete straight razor. The wood and cork bottle stopper has the words "New York" imprinted on it. The razor has lettering that indicates it was patented in 1907.